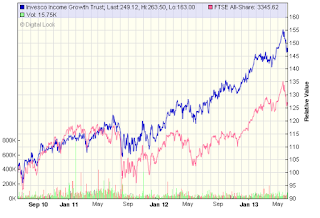 I have just had a look at my portfolios - sipp drawdown and ISA - for the 6 months to the end of June. We have had a bit of a wobble recently around fears over QE and the slowing growth in China. I imagine a lot of people were thinking the surge since the start of the year was starting to look a little overdone and the correction was therefore on the cards but when it happens it can be quite unsettling. I suspect the recovery, such as it is, will continue in fits and starts but because there will be such low growth, it probably won’t feel like one. The FTSE 100 is down -5.6% in June at 6,215 and down just over 3% for the quarter. However, since the start of 2013, the FTSE 100 is up 5.4% - if we add on another 1.6% for dividends paid, this will give a ballpark figure of 7.0% total return for the half year. Over the past 3 months, I have taken the opportunity to take profits on one or two holdings - Aberdeen Asset, IG Group, RPC and this week, DS Smith. As the markets pulled back, I have recycled the proceeds into new holdings in Vanguard All World High Dividend ETF, Finsbury Growth & Income IT and Nat West Bank Preference shares (see recent posts). Individual shares have been a little mixed, defensives seem to be holding on to gains but cyclicals including commodity related shares are continuing to lose ground - maybe things will turn around during the second half of the year. The better performers were again Reckitt & Benckiser (22.0%), and Unilever (18.6%) and also GlaxoSmithKline (25.9%). On the naughty step were Carillion (-9.0%), BHP Billiton (-19.4%) and BSkyB (-9.0%). As a result of locking in some gains at the top of the market in May, the shares portfolio is up 8.5% over the past 6 months (slightly better than the investment trusts - which makes a change). Total income on shares so far is 2.5%. Most of the trusts have lost a little ground in recent weeks but remain in positive territory for the half year under review. The total return to 30th June was 7.2% - the better returns came from smaller companies specialist Aberforth (19.0%), followed by Law Debenture (15.7%), Temple Bar (15.5%), Bankers (15.5%), Edinburgh (13.1%) and Murray Income (13.4%). Losing ground this quarter have been recent addition Aberdeen Asian Income (-11.1%) and fixed income specialist New City High Yield (-4.8%). 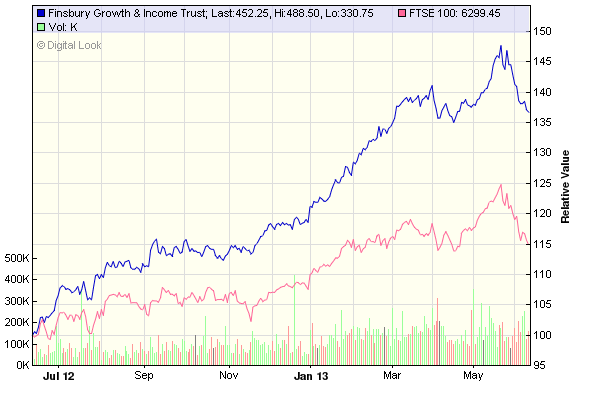 Income from the trusts portfolio has been steady at 2.0%. The PIBS and preference shares have all been affected by the problems at the Co-op Bank over the past month. This so called caring, ethical bank which avoided ‘casino banking’ was supposed to be an example of how all banks should be run. It was even promoted by the Government as the preferred bidder for the Lloyds Bank branches so there was due diligence undertaken at the highest level and never any suggestion from the regulator that they had any concerns - makes you wonder sometimes about these so called ‘financial experts’. Another area of concern was an announcement by the Prudential Regulation Authority last week requiring several banks and building societies, including Nationwide and RBS, to strengthen their balance sheets with further capital. The Nationwide is now considering the issue of new bonds to raise an additional £1bn. Because of the above concerns, all mutuals - Nationwide, Skipton, Coventry etc. - will need to work harder to reassure investors and institutions that there is no danger of them defaulting on their existing bonds and PIBS. In the meantime prices have fallen and margins have widened however, for the adventurous (or foolish! ), the additional risk premium has offered opportunities to secure yields approaching 10% on some PIBS. Capital values on my holdings have fallen in recent weeks - around 5% or 6% bringing them down to just below their value at the start of the year. This has been offset by income of 3.5% so, all in all just around breakeven for the six months. As a whole, the portfolio has advanced 4.9% over the first 6 months of this year including the payment of 2.6% income. Steady if unspectacular (but at least I don’t hold gold which has fallen around 30% in recent months!). As always, I would be interested to hear how others have done - leave a comment if you keep track of your portfolio. Just a quick update on this as just returned from a short break and lots to catch up with (and lots of spam emails to delete!). I wrote a short article on this back in April. They have today issued full year results (link via Investegate) which have been well received by the market and the share price is up around 5% in early trading at over 250p. Profits have increased over 50% and it is proposed to increase the dividend 36% to 8.0p giving a forward yield of around 3.2%. Having made a good return on this in a relatively short period, I have decided to sell into the rising market price - I suspect in the longer term this may be a foolish decision but I will take the opportunity to diversify the portfolio and add to my initial stake in Vanguard All World High Dividend ETF. This has been a turbulent few weeks for the markets and it will be interesting to see how the portfolios have weathered the squall (or not). I will try to post updates after Fridays close. 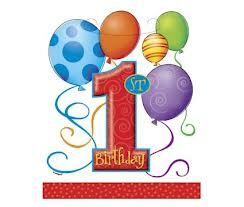 Bankers has been around for a very long time - well, since April1888, and has just celebrated its 125th anniversary. They sit in the global growth sector but could just as equally be in the global growth & income sector with a current yield of 2.6%. (Unfortunately, I have only held this for the past 3 years!). The trust has been in the hands of experienced manager Alex Crooke since 2003. During his tenure, dividends have almost doubled from 6.78p to 13.33p a CAGR of 7.0% per annum. I have a figure of 13.9p pencilled in for the current full year. 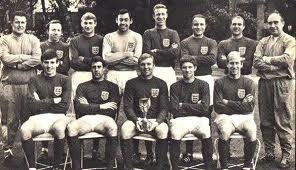 They have a distinguished record of having increased dividends in each of the past 46 years (that’s since England last won the World Cup!). Geographic weighting is more focussed on Europe - UK is 41% and the rest of Europe 12.5% - other areas are US 20%, Asia/Pacific 13% and Japan 10%. They have just released their interim report for the half year to 30 April (link via Investegate). A well positioned portfolio and the improving confidence in equity markets has resulted in a strong performance in the first 6 months of the financial year. Net asset value per share has risen by 16.6%, compared to a rise of 12.1% in the FTSE All-Share Index during the period. The share price has increased from 433p to 536.5p - up 24% as the discount to NAV has narrowed to 3%. Management costs are lower than most at just 0.4%p.a. which means more of the returns are passed on to shareholders. Revenue reserves have increased and represent more than double the total dividends paid out in the past year. Not much chance of this banker going to jail for being reckless! An article on RIT earlier this week on pension income drawdown rates prompted me to review the performance of my sipp drawdown which is just approaching its first anniversary having converted my SIPP into income drawdown in June last year. Whilst researching material for my ebook “DIY Pensions”, I looked at the various scenarios to provide me with the best long-term income from my sipp which had been many years in the build phase. The annuity rates on offer in 2012 were, in my opinion, derisory and therefore it was not a difficult decision to convert to income drawdown. During the early part of last year I started to sell some of my shares - N.Brown, Dialight, Shell Oil, BSkyB, Reckitt, Lamprell and Vodafone - to build the cash fund for the 25% tax-free lump sum. The intention was to repurchase these shares with the lump sum in my ISA (so far only BSkyB, Dialight and Reckitt have been repurchased). I subsequently sold the remaining shares and replaced them with a few more investment trusts - Invesco Income, Aberdeen Asian and Murray Income. Given the predictability of income from investment trusts, these would be an ideal vehicle to generate the income I would need for drawdown. Including income, the total return for the 12 months is over 20% which is obviously pleasing. 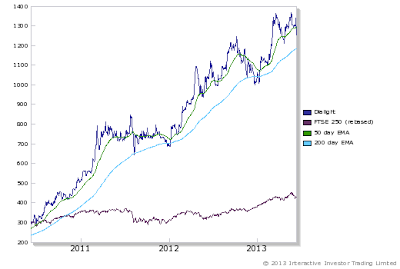 The market generally has performed well over this period - at the start, the FTSE 100 was 5,570. I plan to maintain a rough split of 60% equities to generate a rising income which should keep pace with inflation. In this regard, the drawdown sipp is an index-linked annuity substitute. The starting drawdown amount was limited under the GAD rules to just under 5% of the initial capital amount of £62,000 - i.e. £3,080. My plan was to withdraw less than the max. to start off and gradually build up a reserve. Once the reserve reaches 6 months equivalent drawdown, which may take another couple of years, I will then be looking to increase the drawdown to take out the maximum allowed under the rules. I would not however withdraw at a level which was unsustainable over the long term - I imagine around 5% p.a. should work. Fortunately the GAD rules have recently been relaxed to allow the drawdown limit increase from 100% to 120% so this will provide some flexibility..
One obvious area to address is the overweight holding of Coventry BS PIBS. At some point this year the intention is to diversify into a wider range of higher yielding fixed interest securities. Apart from this, I am happy with my first year of self-managing a drawdown sipp portfolio. I will make a note to update next June. Preference shares are an even more neglected area in the UK market than Pibs. I regard them as a sort of halfway house between ordinary shares and corporate bonds. They offer high and reasonably stable income with relative safety, making them a worthwhile home for investors seeking inflation-beating income with little risk of a missed payment or default. Though they stand behind all corporate debt in insolvency, they rank ahead of ordinary shares. This is true for dividends too, so no ordinary dividend can be paid until preferred holders have been reimbursed. Nevertheless, unlike payments due on conventional debt, there is no recourse to the company if it isn’t paid. You cannot wind up a company for failure to pay a preferred dividend, which is one of the reasons why preferred shares rank as tier one capital for banks. But dividends on preferred shares are cumulative, so solvent companies usually make up payments eventually. 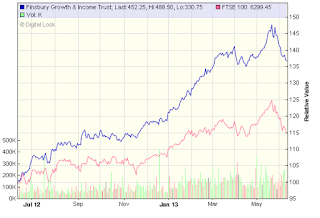 I already hold Lloyds Bank 9.75% Prefs (LLPD) which I picked up last year when payments resumed. Today I have purchased Nat West Bank 9% Prefs (NWBD) @ 120.5p and a starting yield of 7.5% payable gross half yearly. 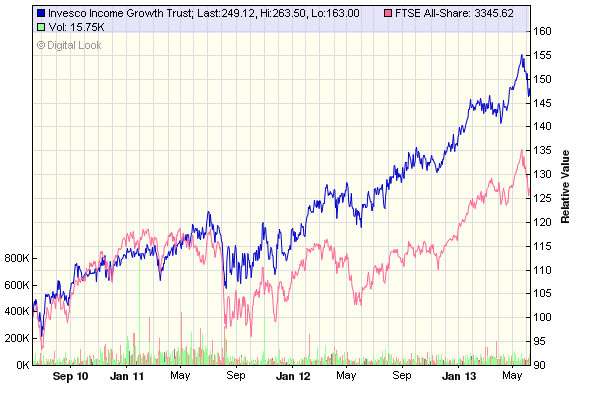 Both form a small part of my fixed interest portfolio. For more detail on NWBD, here’s a link to an article on Monevator from May 2010. Here's a more recent article from last November by Mark Taber's blog on Fixed Income Investments. On the same day I made an initial purchase of Finsbury Growth & Income Trust @ 455p (see last weeks post) and a starting yield of 2.3%. I would not normally purchase on such a low income however, taking the two transactions together, the combined yield will be just under 5% which is much more acceptable. As ever, please DYOR - particularly if considering preference shares and/or PIBS. Many small private investors holding Co-op Bank PIBS have had their fingers burnt in recent weeks! This income investment trust was launched last October and has recently issued its first half year report to 30th April 2013 (link via Investegate). The manager believes that during the current increased market volatility and ongoing global macroeconomic concerns, dividend-paying equities offer two distinct attributes that make them especially attractive. First, the dividend offers a potential income stream that is very attractive relative to alternatives like fixed income rates. . Dividend paying equities have been performing strongly relative to non-dividend paying equities, as the market is placing a higher value on the downside protection that dividends historically have offered. In the 30 year period to 31 December 2011 S&P 500 dividend paying companies have generated annualised total returns of 8.61%. as compared with 1.35%. for S&P 500 non-dividend paying companies. Secondly, in bear markets, the average total returns of companies that pay dividends have gone down, on average, about half as much as those that do not pay dividends. Dividend paying companies historically have also outperformed in bull markets. Over the 6 month period, NAV has increased by 14.2% and to satisfy demand, a further 12.5m shares have been issued. The aim is to pay four quarterly dividends of 1.0p - starting yield of 4.0% - and are on track with a total of 2p declared todate. dividends in the S&P, close to a 15 year high, and the value of dividends paid in the last twelve months was US$281 billion, an all-time record for the US equity market. This income trust offers an opportunity to tap into some of the largest US companies - the top ten holdings are Chevron (3.3%), JP Morgan Chase (3.2%), Wells Fargo (3.1%), Pfizer (2.4%), Home Depot (2.4%), General Electric (2.4%), Comcast (2.3%), Verizon (2.2%), Exxon Mobil (2.2%) and Philip Morris (2.1%). Early days for this IT but appears to be off to a good start. 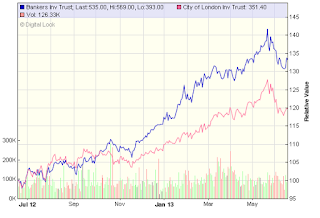 Finsbury Growth & Income Trust is one the top 3 UK Growth & Income Trusts in terms of net asset value and share price performance over the past one, three and five years - its returns far outstripping those of the FTSE All-Share index. Its emphasis is very much focussed on growth and yield is one of the lowest in the sector - currently 2.2% - but its aim is both capital and income, with a total return in excess of the FTSE All-Share. Fund manager Nick Train has managed the trust since his firm, Lindsell Train was appointed in 2000. Train is influenced by the Warren Buffett approach to investing and favours a portfolio of ‘quality’ undervalued companies with strong brands or powerful market franchises, looking for attributes such as the ability to prosper through business cycles for many years; grow earnings every year; strong free cashflow and generate earnings growth without making heavy balance sheet investment. He holds shares for the long term regardless of short-term volatility, aiming for them to double or more in value over time. This results in extremely low portfolio turnover, which saves on transaction costs. The current portfolio consists of just 26 holdings weighted in favour of consumer goods and services and include Unilever, Diageo, Heineken and AG Barr. The trust levies a performance fee on the annual increase in market capitalisation, provided attainment of absolute return hurdle of increase in retail price index (RPI) inflation plus 6 per cent. However, this extra fee is capped at 1.25% of market capitalisation and the trust's total expense ratio is currently just under 1%. This has been on my watchlist for possible purchase for over 12 months, during which time the price has not dipped enough to provide a decent starting yield. However, the share price has increased around 35% during this period. As interest rates on savings have fallen even lower in recent months, a starting yield in excess of 2% with the prospect of significant capital appreciation is starting to look more attractive. If the sp continues its recent decline, I think I will make an initial purchase before too much longer. This trust has been managed by Ciaran Mallon since 2005 and is part of the UK growth & income sector. The investment objective is to provide shareholders with long-term capital growth and real long term growth in dividends from a portfolio yielding more than the FTSE All-Share Index. It is from the same stable as Neil Woodfords Edinburgh IT reported on last month. The trust issued its annual report yesterday for the 12 months to 31st March 2013 (link via Investegate). On a total return basis, net assets increased 23.7% over the year compared to the benchmark FTSE All Share rise of 16.8%. The trust has outperformed its benchmark index over 1, 3, 5 and 10 years. The board are recommending a final dividend of 3.55p which will make a total for the full year of 9.55p - an increase of 3.8% on the previous year (2012 was 9.2p). Dividend CAGR over the past 10 years is 7.8%. The current yield is around 3.8%. As with Edinburgh IT, the manager avoided the mining sector which was a big positive. Another contributor to out-performance came from clothing retailers Next and N. Brown. Another strong performer was AIM listed Nichols (see recent post). “My investment strategy of the past three years remains intact - I am seeking companies with strong fundamentals, with sensible management whose interests are aligned with shareholders and with a low risk balance sheet. Despite the stock market's recent rise, the shares of many of these strongly placed companies continue to look attractive, and I am confident about the outlook for long-term returns from the portfolio”. Finally, although the share price has seen a strong rise in recent months, IVI is one of the few investment trusts in the UK growth & income sector which trades at a discount to its NAV. The trading update issued today has not been received well by Mr. Market and the share price is down around 12% in early trading to 1150p area and reversing all the progress made since the beginning of the year. Lighting is on track to deliver in excess of 50% increase in revenues compared to the previous year, however the signals sector of the business is causing some concern. That said, they are hoping for a recovery in this sector for the second half and expect full year profits to be broadly in line with expectations. Interim results for the half year to 30th June will be published on 22nd July. My personal feeling is the sp fall is an over-reaction and the long term future for Dialight remains positive. Any further retreat in the price could be a good top-up opportunity. RPC was a fairly recent addition to my portfolio - only added in mid 2012. RPC is a plastic packaging company that focuses on innovating lightweight, stronger products. It manufactures items such as the coffee capsules, plastic Dulux paint containers and even asthma inhalers. Yesterday they issued full year results for the 12m to 31st March 2013. Due to a variety of factors - higher polymer prices, adverse movement in exchange rates etc.- sales and profits were down on the previous year and debt had increased. The proposed full year dividend will increase by 3.5% to 14.9p providing a forward yield of around 3.6%. Most of the groups operation is focussed on Europe and I’m sure RPC will do well when the Eurozone recovers but this could be some way off yet. I was not particularly impressed by these results and have decided to sell into the rising share price. The proceeds have been used towards the purchase of the Vanguard All World High Dividend ETF. Further to last weeks mention of this new offering from Vanguard, I have done a little more research to establish the companies which make up the top holdings. The index consists of over 1,000 holdings but here is a list of the main players which make up just under 40% of the index. I am happy with the quality of these leading global income providers and have today purchased my usual 'half ' and will add to this should the share price fall back in the coming months. The purchase price was £31.60. The forecast yield is 4% and will derive from a diverse mix of sectors including financials 22.6%, consumer staples 12.7%, health care 11.4%, energy 11.0%, industrials 10.0% - lesser weightings come from IT, telecoms and utilities. Here is a link to the FTSE All World Index for those who may wish to have a closer look at this one.